Wang Mei-hua, the director of the Taiwan Intellectual Property Office (TIPO), has big plans for the future of the Office, including establishing Priority Document Exchange (PDX) and Patent Prosecution Highway (PPH) agreements with China and incentivizing Taiwanese companies to invest in FinTech R&D. We sat down with her to discuss this, along with the extent to which Taiwan has strengthened IP protection over recent years and the recent slump in applications by domestic companies. Wang is from a legal background, graduating from the National Taiwan University Law Department before going on to spend much of her career in posts within TIPO. She was appointed as director by former president Chen Shui-bian (of the Democratic Progressive Party) and her husband is DPP legislator-at-large and prominent lawyer Wellington Koo, who featured on the party lists in the recent election after having served as legal counsel for now President-Elect Tsai Ing-wen, as well as for the students who participated in the 2014 Sunflower Student Movement. Wang has served in her current post for just over 8 years, in which time she has overseen the signing of Patent Prosecution Highway (PPH) agreements with the US, Japan, Spain and South Korea and cross-strait agreements on intellectual property right protection and cooperation. In addition to this, under her tenure, there have been amendments to Taiwan’s patent, trademark, copyright and trade secret acts and the Office has launched international initiatives between examiners from different countries to improve examination standards. She says that she has also worked closely with industry heads in order to ensure that the Office is serving its purpose in promoting innovation. 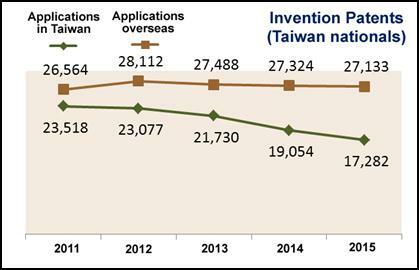 Although she stated that the number of patents Taiwanese nationals and corporations applied for overseas has remained more or less level, Wang acknowledged the fall in patent applications in Taiwan by Taiwanese nationals and corporations over the last 2-3 years, citing Fig. 1-3 below and attributing it to the economic downturn in the country, a fall in exports and the exodus of business people to China. She challenged the idea that a fall in patent applications indicates a lack of innovation, however, and stated that consultations held annually from 2014-2016 with business owners had suggested to her that costs and disclosure requirements are stopping companies from patenting smaller inventions. She also stated that businesses had turned their patent strategy towards China and the USA, where their main competitors are located. She pointed to a change in patent strategy by one of Taiwan’s major patent applicants, Hon Hai Precision Industry, which trades as Foxconn in China, as having a disproportionate influence on the figures for patent applications in the country. She said that Hon Hai along with other Taiwanese patent holders are developing a more sophisticated outlook on their patent portfolio. Many companies have invested heavily in patents in previous years and this has led to increasing maintenance costs arising from renewal fees. Wang stated that this has been a major factor when companies are considering applying for new patents and has led to more conservatism. Another possible reason for the slump, said Wang, is the high rate of invalidation of patents and the low rate of compensation for infringement since the establishment of the Intellectual Property Court in 2008. This has led to questions as to the viability and effectiveness of the court. Wang stated that the rate of invalidation has fallen from an average of 59.5% from July 2008- December 2014, to an average of 44.35% from Jan-Dec 2014. The revocation rate after final decision on invalidation also fell from 54% to 43%, with patents revoked by the IP court averaging at 27%. 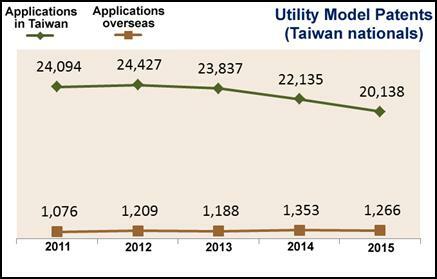 Taiwan’s patent approval rate also grew from 53% to 57% between 2009 and 2013. 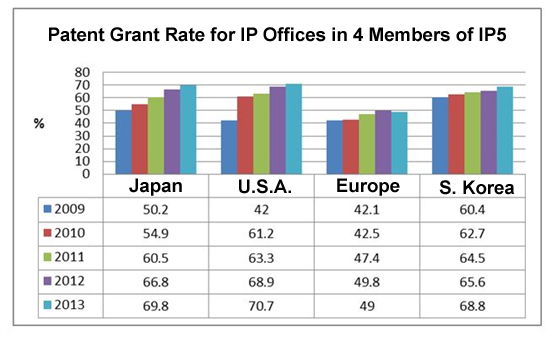 The table below compares the patent grant rates for the IP offices of four of the IP5 countries/regions. Taiwan’s patent approval rating was 57% in 2013, putting it in between the 49% approval rating in Europe and the 69.8% approval rating of Japan and the 70.7% approval rating in the US; Taiwan’s approval rating grew further to 63% in 2014. There are very few invalidation cases in Japan (only 150 in 2014) corresponding to a very low invalidation rate of 26%, whereas in the US the rate by which patents were revoked by the Patent Trial and Appeal Board (PTAB) was pegged at 70%. In Taiwan the 2014 invalidation rate stood at 44.35%, putting it between the US and Japan. Wang stated that the invalidation rate in Japan previously soared after the establishment of an IP court there in a similar way to hike in the rate in the US, but this rate gradually fell. Wang cited measures being unrolled by the Taiwanese government to encourage R&D and lead to increased patent protection, including the establishment of Ministry of Science and Technology (MOST) Germination Plan Functional Units – aimed at developing practical and commercial technology – at eight of Taiwan’s top universities, as well as the formation of major and minor industry-academia alliances; the former focused on matching academic research teams with Taiwan-based transnational tech giants, in order to develop novel advanced technologies; while the latter is aimed at establishing laboratories to undertake research helpful for Taiwan’s small and medium-sized enterprises (SMEs). She said that measures were also being explored to ensure that patents serve as a proper incentive for research and development by universities, research institutes and corporations, by pushing up the revenue derived from them. Wang said TIPO has made proactive efforts to provide assistance to industry, citing the Office’s recent efforts to encourage industry participation in the development of the Financial Technology (FinTech) sector, and investigate the reasons the sector in Taiwan is currently lagging behind its international peers. She said that funding for R&D is mainly being provided by the Ministry of Economic Affairs’ Department of Industrial Technology, the Ministry of Science and Technology and the Council of Agriculture. The decentralized nature of this funding structure, however, results in R&D being a little scattered, and Wang called for a reorganization to ensure that funding is more targeted. Another major government role in encouraging innovation is improving the role of creativity in the education system starting from elementary school level she stated, citing efforts to create links between industry and education at all levels. TIPO is also attempting to improve the level of professionalism within the patent system with its specialist academy dedicated to intellectual property education, the Taiwan Intellectual Property Training Academy (TIPA), directed at providing training to patent agents and examiners, which is expected to reduce infringement and bring down the level of patent invalidation as the quality of patents and examinations improve. Wang stated that Taiwan is an attractive destination for foreign patent applicants, due to its international standing in R&D in the ICT sector, as well as its strategic geographical position allowing it to serve as an effective stepping stone for firms to expand their patent portfolio into Asia. This is due to Taiwan’s substantive legislation in the area of intellectual property, as well as its links to both the Chinese and the global market, she said. Although, at China’s insistence, Taiwan has not been granted membership of the United Nations World Intellectual Property Organization (WIPO), it still abides by WIPO resolutions and its legislation is kept in line with the international community and international treaties. A specialized intellectual property police force has also been established in Taiwan, something uncommon in the international community, said Wang. 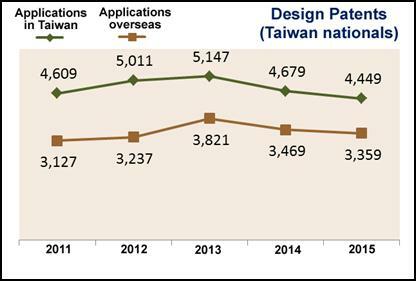 Another attractive aspect of the Taiwan patent environment is the relative speed and quality of substantive patent examinations in Taiwan, as it ranks ahead of China and many other countries in terms of speed of examining foreign patents, at 23-24 months after filing date (date of submission of the English-language specification). Wang even speculated that if measured on the same metric, TIPO may even be faster at processing foreign applications than the Japan Patent Office. Patent maintenance fees in Taiwan are also relatively low compared to China. According to Article 12-1 of the Statute for Industrial Innovation, corporations obtaining stocks in exchange for their patented technologies may have their taxes deferred. This is expected to attract foreign investment to the country. Although Taiwan and China have similar patent systems overall, China has instituted measures over recent years intended to encourage businesses to apply for more patents, said Wang. This has led to a lot of abuse in the Chinese system, with a lot of low-quality patent applications made simply to secure incentives. Taiwan does not have this kind of system in place, which means that companies cannot profit from low-quality patents in the same way as their Chinese counterparts. Both Taiwan and China have three main types of patents: invention, utility model and design. In Taiwan design patents are also subject to substantive examinations, whereas they only go through a “formalities” examination in China. Partial designs are already patentable in Taiwan, whereas in China, they cannot be patented. The term of a design patent is 12 years in Taiwan and only 10 years in China. In terms of administrative remedies, China has a well-established and independent patent reexamination board that handles reexamination and invalidation cases, said Wang. If the applicant disagrees with the board’s decision they can file a lawsuit. 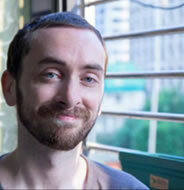 In Taiwan, however, both the reexamination and invalidation systems are administered by TIPO, she said. If the applicant disagrees with the decision, they first have to file an administrative appeal and then file a lawsuit with the IP Court, which handles both patent administration and civil lawsuits, said added. Other differences include that in China, the patent authorities have administrative authority to settle disputes over patent infringement, fake patents, or defaults on patent licensing agreements. In China, patent border protection measures are stipulated in the Regulations on Customs Protection of Intellectual Property Rights. The measures in question can be divided into “requested protections” and “ex officio protections.” In Taiwan, patent border protection measures are listed under the Patent Act. The Patent Act does not require ex officio seizure of infringing products. Rather, seizures need to be requested. This is because it is hard for customs personnel to determine which goods may infringe a particular patent, Wang said. Wang also revealed that TIPO is in talks with China’s State Intellectual Property Office (SIPO) regarding a priority document exchange (PDX) agreement, and that this will hopefully pave the way for talks over establishing a cross-strait Patent Prosecution Highway (PPH). We also asked Wang how Taiwan compared to the US in the post-Alice era when it comes to the patentability of software and business methods. Wang stated that if the Supreme Court interpretation is followed to the letter by the USPTO in the US, this would make it extremely difficult to obtain patents of this kind there. In Taiwan, she stated, software patents are patentable, but inventors must meet certain requirements, such as novelty and incorporating an inventive step. Taiwan’s policy on software patents is based on the experience of the US, Europe and Japan, amongst other countries, but the main requirement is that there is a technical character to the patent matter and that it is novel. Any non-technical aspects of the patent matter must also interact with this technical aspect, she stated. If you want to patent software, it cannot just use already existing functions to solve equations or to realize commercial goals. Wang said that Taiwan’s Patent Act is more in line with legislation in the EU and Japan, than the US, adding that the major applicants for software patents in Taiwan thus far have been from Chinese in e-commerce and internet giants like Taobao and Tencent. North America Intellectual Property Co helps with patent filing & management in US, Taiwan and elsewhere. Previous post: DIGITAL LIBRARIES: SOLUTION or PROBLEM FOR ORPHAN WORKS?